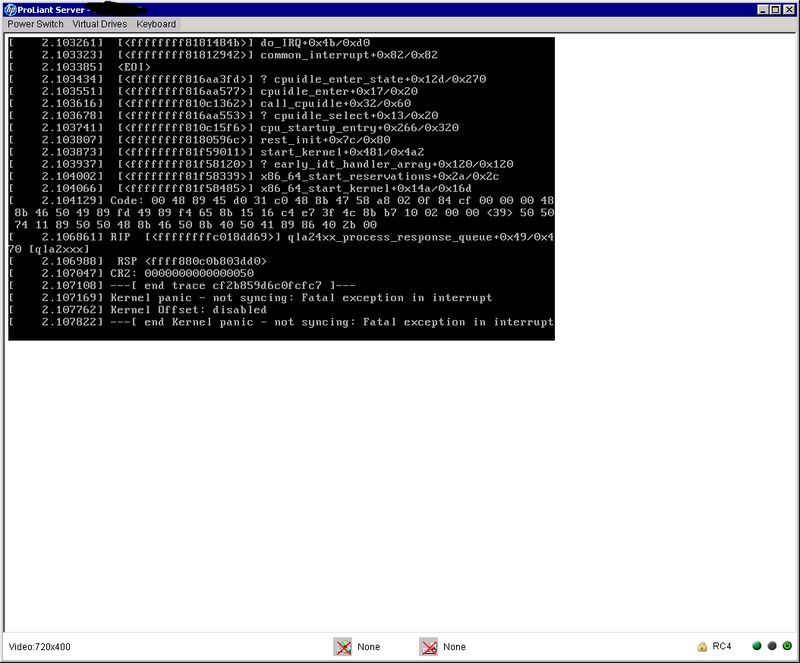 Latest Xenial kernel (linux-image-generic-4.4.0-8-generic) is crash on booting. Same problem with 4.4.0-9 and 4.4.0-10. [ 247.431349] qla2xxx [0000:06:00.0]-0034:3: MSI-X: Unsupported ISP 2432 SSVID/SSDID (0x103C,0x1705). [ 247.807564] qla2xxx [0000:06:00.1]-0034:4: MSI-X: Unsupported ISP 2432 SSVID/SSDID (0x103C,0x1705). I try build original kernel from kernel.org(4.4.4). Configure with make-kpkg. Revert "qla2xxx: Fix warning reported by static checker"
Revert "qla2xxx: Fix TMR ABORT interaction issue between qla2xxx and TCM"
Revert "qla2xxx: Use ATIO type to send correct tmr response"
Revert "qla2xxx: use TARGET_SCF_USE_CPUID flag to indiate CPU Affinity"
Reverting all qla2xxx patches since v4.4 isn't really an option since it would impact bug #1541456. If this test kernel doesn't work for you, then it would be helpful to know what was the last version that did work. The post v4.4 qla2xxx updates were first released in linux 4.4.0-4.19, so I'd start with a version prior to that. I try kernel 4.4.0-12 (ubuntu branch). Same problem occured as what I experienced with the previous versions. Kernel.org 4.5rc7 kernel crashed, same with ubuntu branch! I started a kernel bisect between 4.4.0-3 and 4.4.0-4. The kernel bisect will require testing of about 6 test kernels. 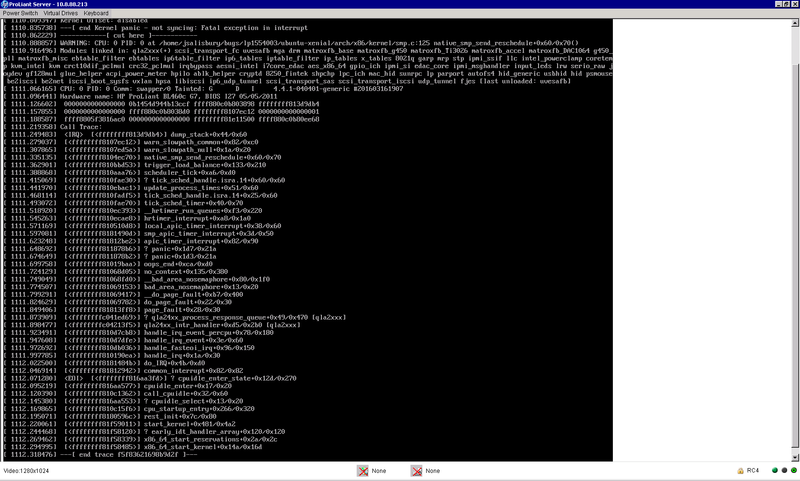 I try 4.4.0-4.18~lp1554003Commitb1aa887df kernel, is good! lp1554003Commitfa87c422 is good, dmesg attached. lp1554003Commitd3b9bcd9c works fine, no panics. I'll build a test kernel with a revert of this commit for testing. Revert build is good! Dmesg attached. Can folks affected by this bug test this kernel and see if it fixes the bug? [ 98.715393] qla2xxx [0000:00:00.0]-0005: : QLogic Fibre Channel HBA Driver: 8.07.00.26-k.
[ 98.715608] qla2xxx [0000:10:00.0]-001d: : Found an ISP2432 irq 18 iobase 0xffffc90003612000. [ 98.716407] qla2xxx [0000:10:00.0]-0034:1: MSI-X: Unsupported ISP 2432 SSVID/SSDID (0x103C,0x1705). [ 99.112872] qla2xxx [0000:10:00.0]-00fb:1: QLogic QMH2462 - PCI-Express Dual Channel 4Gb Fibre Channel Mezzanine HBA. [ 99.112883] qla2xxx [0000:10:00.0]-00fc:1: ISP2432: PCIe (2.5GT/s x4) @ 0000:10:00.0 hdma+ host#=1 fw=8.03.00 (9496). [ 99.113074] qla2xxx [0000:10:00.1]-001d: : Found an ISP2432 irq 19 iobase 0xffffc9000361e000. [ 99.113264] qla2xxx [0000:10:00.1]-0034:2: MSI-X: Unsupported ISP 2432 SSVID/SSDID (0x103C,0x1705). [ 99.500825] qla2xxx [0000:10:00.1]-00fb:2: QLogic QMH2462 - PCI-Express Dual Channel 4Gb Fibre Channel Mezzanine HBA. [ 99.500836] qla2xxx [0000:10:00.1]-00fc:2: ISP2432: PCIe (2.5GT/s x4) @ 0000:10:00.1 hdma+ host#=2 fw=8.03.00 (9496). [ 100.717278] qla2xxx [0000:10:00.0]-500a:1: LOOP UP detected (4 Gbps). [ 101.105997] qla2xxx [0000:10:00.1]-500a:2: LOOP UP detected (4 Gbps). lp1554003V2UpstreamPatch is good, dmesg attached.